The Comfort King wants to help you save on any potential charges when it comes to your heating and air conditioning system. Check out our special offers and see how you can save some extra money. 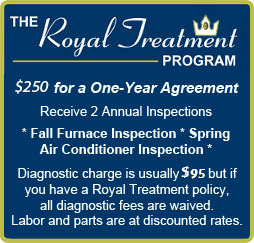 Diagnostic charge is typically $95, but if you have a Royal Treatment agreement, the diagnostic fee is waived. Also, get labor and parts at discounted rates. A one-year agreement costs $250, with two annual inspections included: a fall furnace inspection and a spring air conditioner inspection. Call now and get $100 OFF any new equipment installation. This may not be combined with any other offer, and is on equipment only, not on accessories. Financing is available for any installation. Call us today to learn more about your financing options. Take advantage of our FREE estimates on equipment. Service on all residential and commercial makes and models. We provide veteran and senior citizen discounts.